Dina Kowal Creative: Show Time! A few of my Hope You Can Cling To cards reflect a red-black-white color rut I found myself in one day.......... but it was a fun rut, and the cards match, so I want to share! The first card was for a music challenge, posed to us by Tenia, who is a professional jazz pianist. I had a card similar to this sketched in a notebook I always carry with me when we're out... I thought this would be a fitting time to try it! 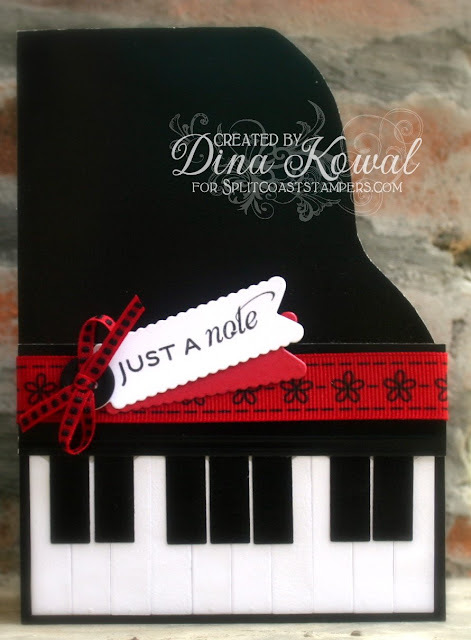 I used the smallest Flags die from Impression Obsession to cut out the keys, and freehanded the curve of the piano with scissors. The sentiment is from Flourishes' Tag Lines set. The stamps for my second card are from Hambo Stamps, one of the sponsors of our card drive this month! Hambo Stamps are brilliantly 'punny,' and perfectly appropriate for a challenge entitled "You Have Me In Stitches!" I actually used my crimper on this card - I can't remember the last time I pulled that out! The tag and scalloped edge are both dies from Impression Obsession as well (Border Duo 2, Mini Rectangle Tags 1). I used an oval diecut for the spotlight 'spot,' and cut a vellum triangle to show the rays. Tied it all off with some twine from the Twinery! Fun stuff. The main image is watercolored with Inktense pencils. grateful I am that I found you!! This is so fun and creative! Love the vellum spot light! Just might have to case this for the kids at musical theatre! Thanks for sharing your creativity! That piano card is just so creative! TFS!